Lib Dems in York: help needed to spread the word! Its just 4 weeks till the Lib Dems arrive in for their conference in York. Fancy lending a hand with spreading the word in neighbourhoods around the city? This Thursday (13th) York People’s Assembly are delivering fliers around Bishopthorpe Road, and we’d love to have extra pairs of hands! We’ll be outside Cycle Heaven from 5.30. From 6pm we’ll be opposite Sainsburys on the Scarcroft Road junction. Tuesday 18th: 6-7pm outside Punch Bowl/Independent, on the Haxby Road/Wigginton Road/Lowther St junction, to cover the Groves area. Thursday 20th: 6-7pm outside The Fox, Holgate Road/Acomb Road junction. Look out for more sessions on Tuesdays and Thursdays around York. 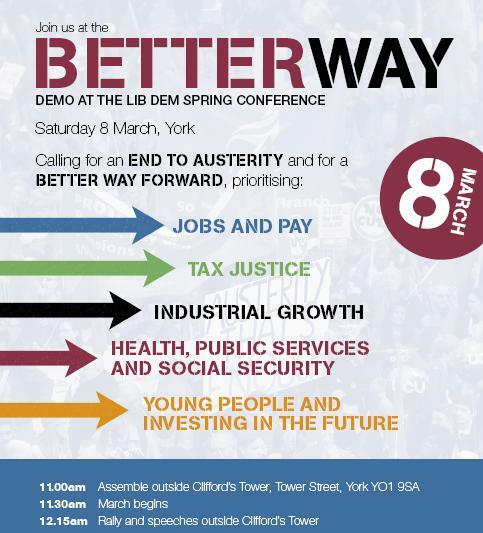 Reblogged this on A Better Way demo – York 8th March.